We are in cahoots with the city’s restaurants, breweries, farm to table establishments, event planners, businesses, and schools. 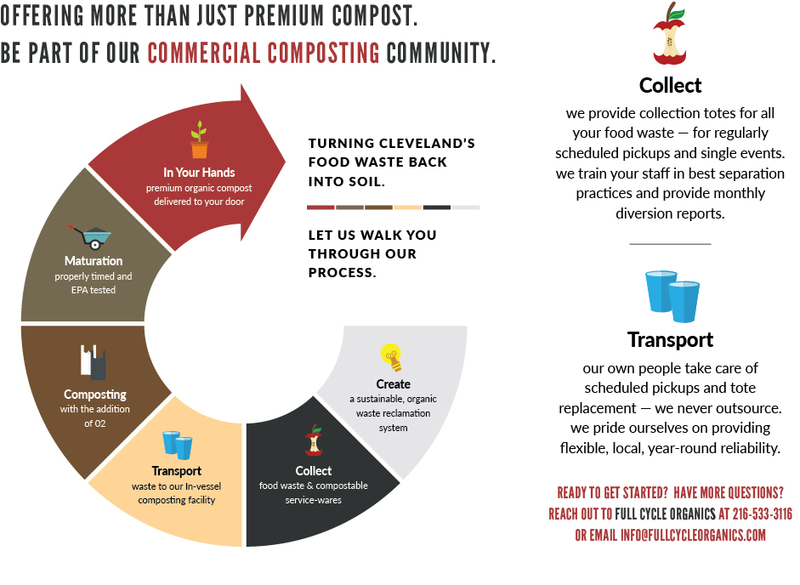 We currently pick up food waste and deliver premium compost products with-in a 60 mile radius of downtown Cleveland. As the word spreads and the demand for our services grows, so will we. We like to keep things simple for our customers. By using In-Vessel Composting methods, we reduce the need for waste separation on your end while maximizing waste recycling. We provide the collection totes and offer year-round pick up of materials regardless of Cleveland’s ever-changing weather. The best part — we never outsource. Your business will always be taken care of by our people 100% of the time.